ISA10 is a the next generation epinephrine auto-injector using light and sound to guide users and ensure correct medication injection. The project is an effect of a 2 week collaboration across interaction designers and product designers at UID. Focus has been to strongly rely on sound and light interactions when developing a product. 73 million people around the world is estimated to suffer from a severe allergic attack at one point in life. Among these people there is an 84% misuse of the injectors, often to hold the injector in place for at least 10 seconds. This is an unknown and stressful situation and for many this is the very first time using such a device. many people express their intimidation of the devices due to it's information overload. ISA10 brings security to users with the use of light and sound throughout the injection process. The injector is accompanied by an app directly connecting you to emergency services after injection. Thanks to the chosen architecture ISA10 it is partly reusable and therefore minimising medical waste. 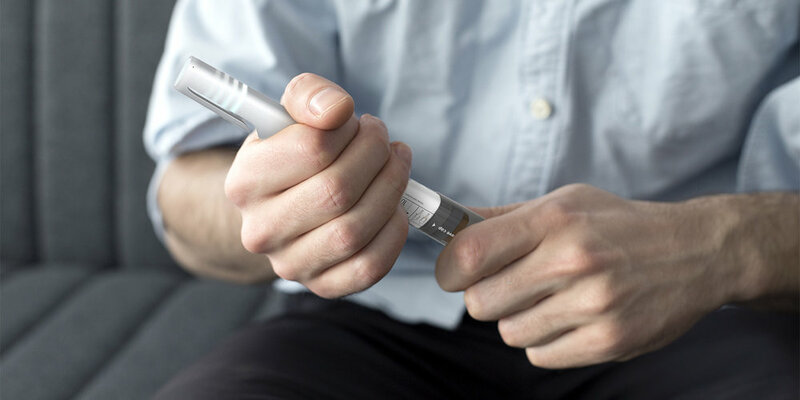 ISA10 creates a supportive, clear and simple user experience that can have a dramatic impact in a life-or-death situation"
Because of the emergency situation, it’s crucial for the observer to find the auto-injector as soon as possible. To trigger ISA10 simply shake the bag or use the app. Light and sound will you locate it. Since the observer often lacking experience with auto-injectors and is using it for the first time, ISA10 makes sure to confirm it's active state with sound and light when the protective cap is removed. The most crucial part is the 10 second injection period. This is where most users fail, leading to a life or death situation. ISA10 gives a sounds sequence designed to keep them from removing the injector to soon. The app will automatically connect the user to emergency service after every injection. This is to make sure a proper follow-up is performed after having a serve allergy reaction. ISA10 is designed to look non-intimidating yet reliable as a medical device acting asa helpful companion to teenagers and young adults. It's shape and cmf allows it to be handled in an easy yet discreet manner even in public spaces. The conical shape gives an sturdy grip that helps to keep it at the right angle when positioned against the thigh. The short timespan made the process extremely high paced, so to make this work we made sure to develop a common vision regarding feedback and user experience before dividing tasks among ourselves. All the different elements of ISA10 where built simultaneously and brought together through continuous communication and user validations. People are estimated to experience Anaphylaxis at one point in life. In most cases they fail to hold the injector in place for 10 seconds leading to a useless medication dosage. Existing injectors are huge, intimidating and overloaded with information. For many this is the first time in this situation and they feel insecure in what to do both during and after the attack. The designers of ISA10 clearly took time to research and understand the specific challenges of the situations in which epi-pens are used"
© 2019 Jenny Holmsten, All rights reserved.